Our brochure is now available! This brochure, written by Jill Geschwint Rabin, an IBCLC and pediatric speech pathologist, and Ella Gray Cullen, Founder and Executive Director of Julia's Way and nursing mother of a child with Down syndrome, with input from Kimberly Barbas from Boston Children's Hospital and Dr. Davidson from the Down Syndrome Program at Boston Children's Hospital, is designed to support mothers and medical professionals understand and overcome the challenges that babies sometimes face when attempting to breastfeed. These are perfect for inclusion in New Parent Packets and distribution by genetics counselors, NICUs, labor and delivery floors, and Down syndrome clinics. These brochures are a prelude to the book we are writing, due out in mid-2018, and we know they will help so many moms feel supported and encouraged to breastfeed their babies. They're chock-full of helpful information! Help us save on postage and printing costs by downloading our one-page handout (available in English, Spanish, Portuguese, Vietnamese, Xhosa, and Afrikaans) which has the same content as our brochure. Or, click here to request professionally printed copies (English and Spanish only at this time). 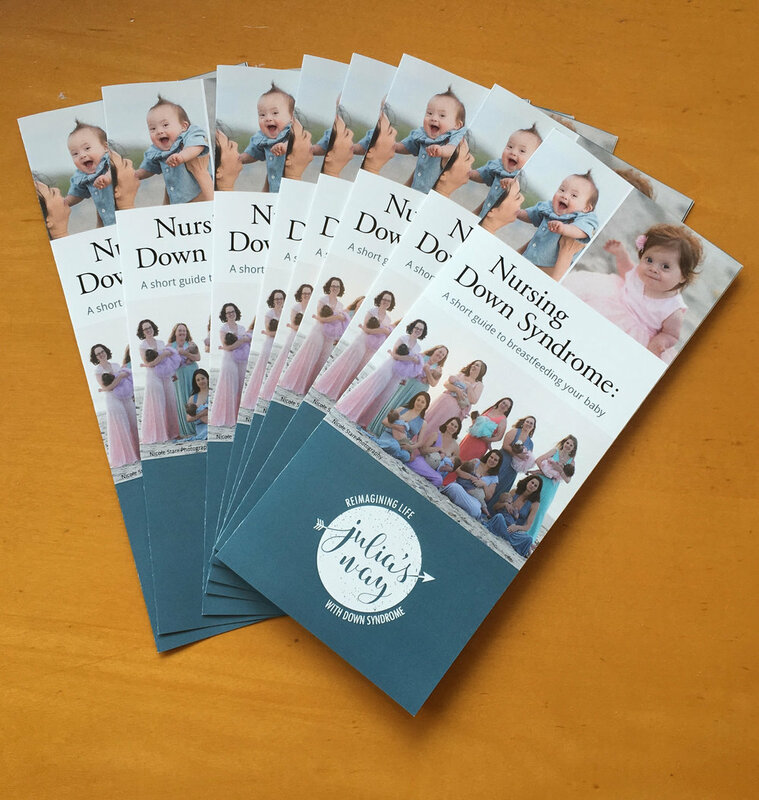 We are so excited to be able to share these wonderful brochures from Julia’s Way with our new families! Check out these beautiful brochures and visit their site for more info!